Living Museum - Museum of Jewish Heritage - WELCOME TO THE LIVING MUSEUM! Find Your Place In Jewish History! Learn how an artifact can tell a story and connect the past, present, and future. Understand how your family's history fits into the broad stream of Jewish experience. Learn how with the Living Museum! The Living Museum helps middle school students in Jewish day and supplementary schools form a personal connection to modern Jewish history by showing how their lives, and that of their families, fit into the modern Jewish experience. With the help of his or her family, each student selects an artifact or heirloom that reflects an important part of his or her family history. Objects and documents serve as catalysts to investigate the past. By learning how to read and interpret them, students begin to appreciate their objects as symbolic representations of their personal histories and the larger communal history. By recording stories of grandparents and other older relatives, students play an active role in the transmission of history across the generations, ensuring that historical memories become part of their daily lives. As a part of the Living Museum project, each student brings in an object that reflects his or her family and the results of his or her research to class. The students' artifacts and findings form the basis of a mini-museum in their school. The grand opening of their museum is a gala event, attended by family and members of the community who come to tour the galleries and learn more about the artifacts from the "curators," i.e., the students, who stand with their objects and explain them to their guests. In this way, the students are transformed from learners into teachers. With the online Living Museum, teachers and students can share the results of their research with the world! Under the supervision of their teachers, students upload images of and descriptive information about their artifacts. 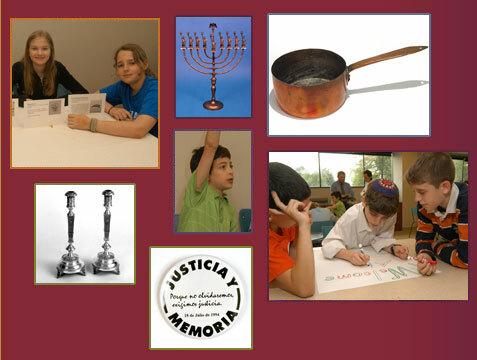 Students see their artifacts together with those of other children around the country and, through their participation in the online Living Museum, see their place within the Jewish community, past, present, and future.